At the time of soldering work, solder riding is satisfactory in each step. This review is about item#9450664. Ease of melt flowability is outstanding. It is a solder which is very easy to work because it comes with flux. I immediately repaired the fixtures, but it was what I expected. I wanted to buy paste or flux at the same time. This review is about item#9450637. There is no problem on riding of solder, there is glossiness. Reliability was satisfactory. Because it is not for work, it is likely to be used for the rest of my life. I think that it is a product that you can use with confidence. I would like to use it in the future. This review is about item#9450576. I use it for wiring of camper. I bought it last time because I finally bought it 10 years ago, but maybe ten years from now I guess there are places I can not use. This product "FS - 301 - 01" is introduced in your company 's catalog as "FS - 403 - 01" and "FS - 403 - 02" along with a melting point of 215 ° C. The melting point of "FS - 301 - 01" is 255 ° C in the material that is in it. This time we purchased this from your company based on the manufacturer's data because solder with a high melting point and low content of tin was necessary, but I would be pleased if you could correct the notation of the melting point. This review is about item#9450612. There are many kinds and it is extremely helpful. I will continue to use delivery as soon as possible. I used it for the wiring work of the motorcycle. Although I have purchased it several times, it is attractive to be able to purchase it at cheap price. Also, thank you. This review is about item#9450682. 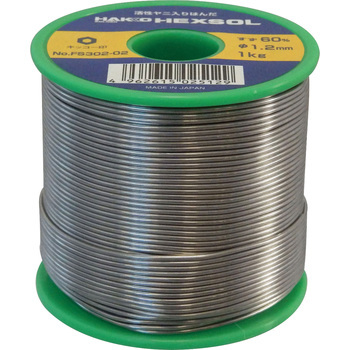 Among many lead-free solders, this product contains lead, it is convenient without solder coming off even at a very low temperature. I sold the same solder and purchased it. It is the same as the one used before, it is also quantitatively appropriate, and it is user-friendly. This review is about item#9450691. Because the price is expensive, I wondered what's wrong. It is very easy to use and no problem. This review is about item#9450655. I am useful regardless of its use. This review is about item#09450673. It is used for soldering work. This review is about item#09450691. This review is about item#09450646. This review is about item#09450612. I think that if it is possible to improve the eight cage of the product that it is good to be rolled but the winding will be loose during use Todoke kids can cut the mount of your company Hunter Open it and use it Will not you decide to remove the backing paper in the future? This review is about item#09450664.